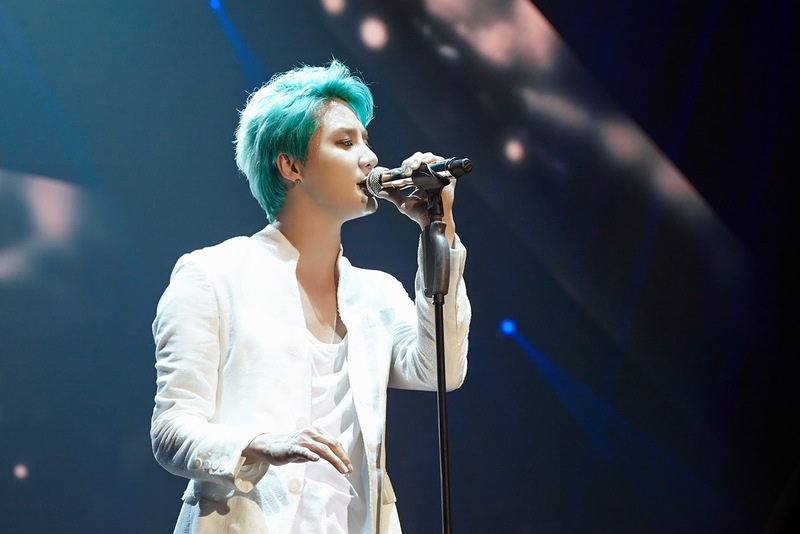 On March 21, JYJ's Kim Junsu(XIA) held his exclusive concert in Thunder Dome in Bangkok, Thailand. 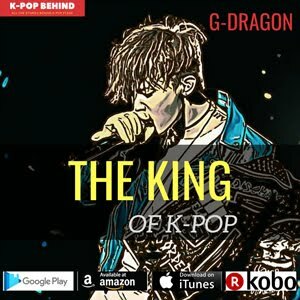 At the concert, he performed a total of 15 songs and electrified 3,000 fans by showing high quality performance. Right before holding the concert, he attended a press conference and talked about his new album and career as a singer. Q. Tell me about your new album 'Flower' that was released on March 3. Junsu: It was my first album in a year and 8 months, so I think it has been quite a long time since I released my solo album. I made a determined resolution before releasing it, and I tried to add some new genres to my new album. For example, I referred to musical numbers. Q. You are on your solo Aisa Tour. How do you feel? 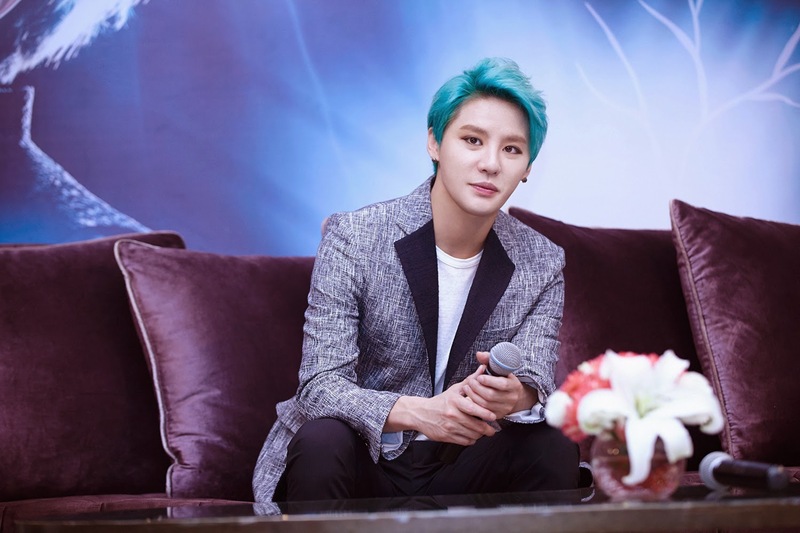 Junsu: Frankly speaking, I'm always nervous when I release my new album or hold a concert. I'm worried if I was forgotten by my fans. However, I know many fans are still supporting me, and I try to express my thanks through my stages. Q. You dyed your hair green. Are there some reasons for it? Junsu: I didn't want to leave my hair black. As you can see in the music video of 'Flower', I tried to express a mysterious atmosphere. I've dyed may hair so many colors, so I didn't have other options but bluish green color. Q. How do you decide set lists for your album and concert? 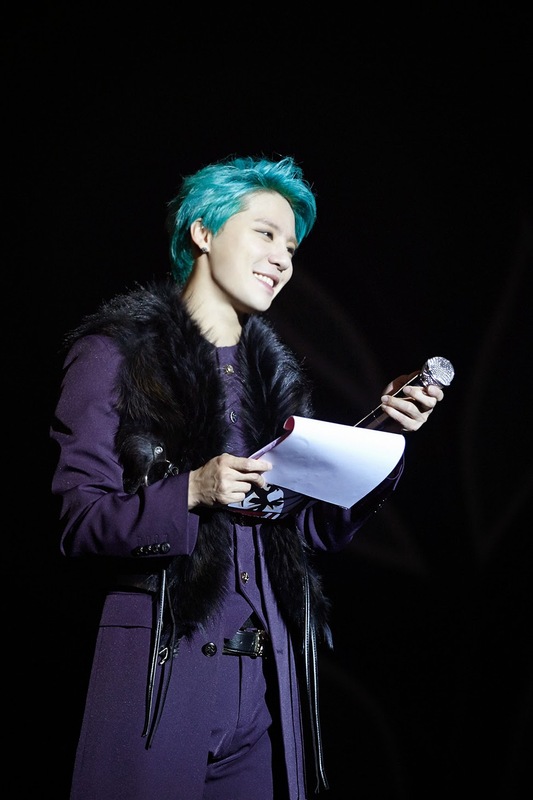 Junsu: Singers usually place important songs at the front. But, I never do that. I want my fans to listen my album from beginning to end. I consider natural flow of tracks when I decide a set list for my album. A set list for a concert needs to have a narrative arc. And I think about change of costumes too. Q. 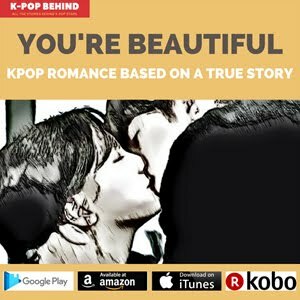 What do you think of your fans in Thailand? Junsu: I do not want to draw a distinction among my fans, but my fans in Thailand are good-natured. They're passionate but thoughtful. When I seen their eyes, I feel comfortable. Q. 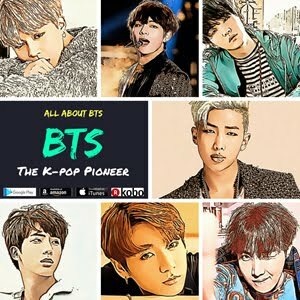 What is your goal as a solo singer? Junsu: I don't have an actual goal as a solo singer. Instead, I want to try my best and show great performance to my fans until I retire. 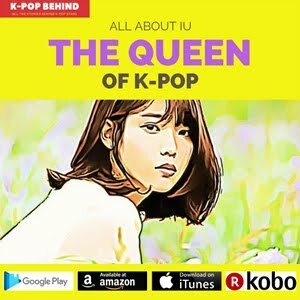 Q. I think there are so many genres in your album. Why is that? Junsu: My album is not for TV performance. It's for my concert. The variety of music makes me able to show various performances on stage. Q. You were recently nominated for the first places of KBS' 'Music Bank' and MBC's 'Music Core' even though you didn't appeared on the shows. How do you feel? Junsu: When I heard the news, I was astonished at it. I feel good, but I have mixed emotions about that. I just try to be easy about that and not to add a special meaning to it. As you know, I can't appear on TV shows. I'm not say that I have to receive a special treatment. But I hope I can sing for my fans on equal terms with other singers. Well, I'm sorry for that, but I think I've gained many things by focusing on my concerts. Q. Whenever you hold a concert, you grant your fans' wishes. Don't you sometimes feel uncomfortable about that? Junsu: Actually, I began the special event in Japan. I can speak Japanese, but I'm not fluent that much. I wanted to have a fun time with Japanese fans. Yeah, I sometimes feel uncomfortable about that because some of my fans make me embarrassed. But, I love to communicate with my fans. Q. Your new album is a full album which has a total of 13 tracks. 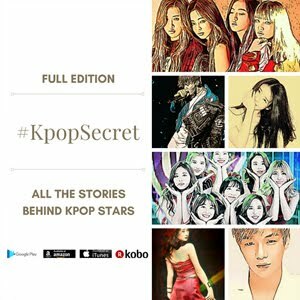 It's unusual that kpop singers release that kind of album these days because most of them prefer single or mini album. 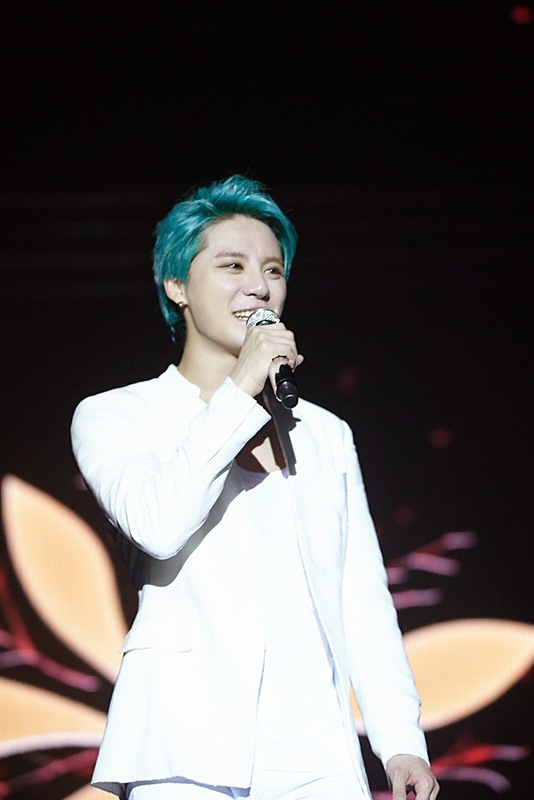 Junsu: Even though I can't appear on music chart shows and it is more profitable to release a single album, I think it is cowardly to release a single and hold a concert. It is a kind of betrayal. I will not betray my fans. Of course, it is dangerous for me and my agency to release a full album. However, I have to satisfy my fans by releasing new songs and performing them at my concert. Q. 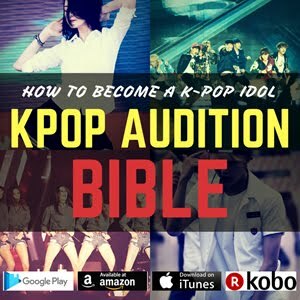 Do you think your music will be changed if you can appear on TV music shows? Junsu: Yes, It is imperative on me to follow the trend. If I can appear on TV music shows, I will do easier music. I think I'm able to appeal to the public by showing my live performance. Actually, broadcasting companies even do not play my music video well, though.